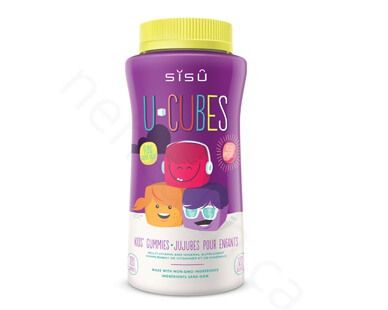 SISU U-CubesTM U-Cubes are specially crafted for children as daily supplement which are pectin based and made with non-GMO ingredients, favors, sweeteners and colours. 3 great flavours: grape, orange, cherry. Despite our best attempts, children’s diets can experience nutritional gaps. Fruits, veggies, proteins, good fats…are all elements we strive to provide but can be a challenge to deliver. Supplementing a child’s diet with a high-quality, pure and safe multivitamin will help you provide your kids with the essential building blocks of a fully complemented diet. SISU U-CubesTM gummies provide the important vitamins and minerals children need daily, in a formula specially designed for kids. 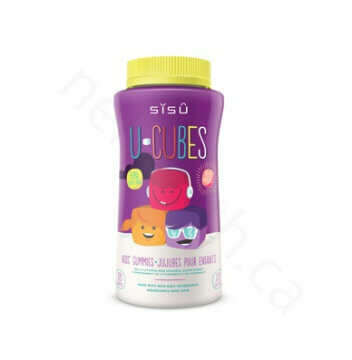 Other gummies are often made with animal gelatin, high-fructose corn syrup, and artificial colours and preservatives – but not SISU U-CubesTM. We stand behind giving your kids the best: pectin-based, naturally-flavoured multivitamin and mineral to help bridge nutritional gaps and provide extra nutrients for growing bodies and minds. dicalcium phosphate, tricalcium phosphate, magnesium citrate, maltodextrin, inositol, silicon dioxide, D-mannitol, sugarcane juice, tapioca syrup, purified water, pectin, citric acid, maqui berry, black carrot juice, turmeric, natural grape flavour, natural cherry flavour, natural orange flavour. Children (2-8 years): Chew 2 gummies 1 time per day. Children (9-13 years): Chew 4 gummies 1 time per day. Take with food. Take a few hours before or after taking other medications.